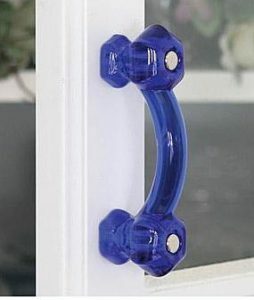 Glass door knobs and glass cabinet knobs bring a vintage look to any home decor. Glass knobs are a must have when renovating or restoring a Victorian, Arts and Crafts and other period homes to retain the historic authenticity. The technology for pressing melted or molten glass into cast iron molds was patented by John P. Bakewell in 1825 and a new era in door and cabinet hardware was soon born. Glass knobs reached their height of popularity around 1917 when metals such as iron, brass, and bronze were needed to make airplanes, tanks, military vehicles, weaponry, and other items for the war effort. In the 1920’s, cut glass and crystal added a new trend in decorative glass knobs. 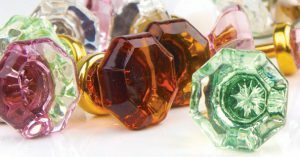 Structurally, cut glass knobs were fashioned to look like diamonds or jewels with 6, 8 or 12 facets. With the stock market crash in 1929 and the ensuing Great Depression, colored glass knobs were cheap to make and dominated the hardware of the 1930’s and 1940’s. Glass knobs were available in an array of pretty colors in addition to the most popular clear glass knobs. The most desired colors were Cobalt Blue, Robin’s Egg Blue, Black, and White, with Green, Amber, Violet, Purple, Red and Jade used as well. With the nation recovering from World War II, the 1950’s were a more prosperous time and metal knobs replaced glass as the door and cabinet hardware of choice in most modern homes. Metal knobs ranged from simple Prairie and New York style to more ornate Victorian and neo-classical. Today, glass knobs add a pop of color in newer homes and add nostalgic charm to both older and newer homes. Van Dyke’s Restorers offers one of the industry’s largest selections of glass and crystal door knobs from the world’s finest manufacturers of cabinet and door hardware including Nostalgic Warehouse, Atlas, Brass Accents, Classic Hardware, Hardware Resources, Hickory Hardware, Acorn, Top Knobs, Schaub, Berenson, Keeler, Lewis Dolin, Carpe Diem, and more. Interior door knobs are paired with a wide range of back plates from round rosettes to rosettes with rope borders, and simple New York style beveled edge plates to elaborate Windsor or Victorian designs. 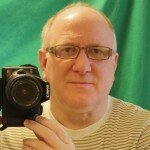 Art Deco is also back in vogue and provides a nice back drop for any color glass knob. Plates are available in many metal finishes to coordinate with any decor. 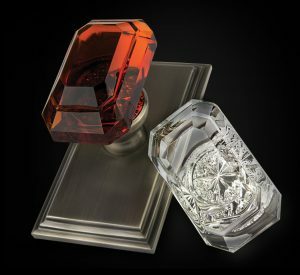 Van Dyke’s selection of glass cabinet knobs and pulls includes round, square, scalloped, octagonal, fluted, melon-shaped, crystal, and faceted knobs.